Stagger the cones in the shape of a parallelogram about 10 yards deep and 20 yards long. Have a player at each of the two inside cones that will not be a passer. The red players are the stationary passers. See the soccer drill diagram for the layout. 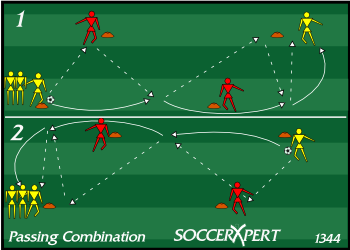 The first player in line plays a one-two (1-2) combination pass with the player at the cone nearest his side. He then plays a one-two (1-2) combination with the player farthest from him around the 2nd middle player. He then returns the ball back to this player who follows the same format in the opposite direction. The yellow players are the only players the rotate positions with each turn. Switch out the red players as needed every 5 minutes or as desired. The soccer drill diagram displays the pattern.